Ok, here’s the deal. Before you commit yourself to making this recipe, do not–I repeat–do not do a Google image search for monkfish. Just don’t do it? Ok? Because if you do, you might just miss out on one of the most delicious fish recipes I’ve ever tried. I’m not messing around. Now let’s get to it. This is another recipe from Thomas Keller’s fantastic Ad Hoc at Home–I’ve been getting some serious mileage out of this book. 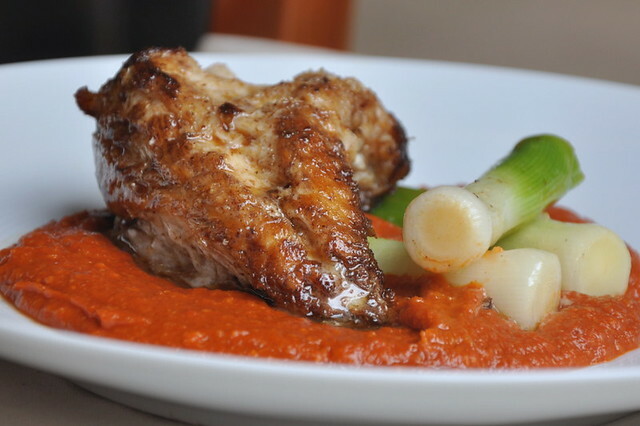 I told you about his romesco sauce, his crab cakes (the best I’ve ever had–hands down), and his Fall Salad (one of my favorites) and now I will tell you about his roasted monkfish. Because when you’ve never had monkfish before (as I never had), you best start with a recipe from Thomas Keller. I had heard that monkfish is often referred to as ‘poor man’s lobster’–and I can kind of see where that analogy comes from. The fish is super meaty–one of the meatiest fish I’ve ever tried. And it’s got a tiny bit of sweetness. But largely, it’s a whole other animal (literally). Part of what makes this recipe really stand out for me is the roasting process. The fish is basted in a browned butter sauce that is fragranced by fresh rosemary and garlic. The smell in my kitchen when I made this was absolutely intoxicating. Ad Hoc at Home is focused on elevating comfort foods, and while monkfish doesn’t typically come to mind when you think of comfort food, once you try this dish, I think it might. 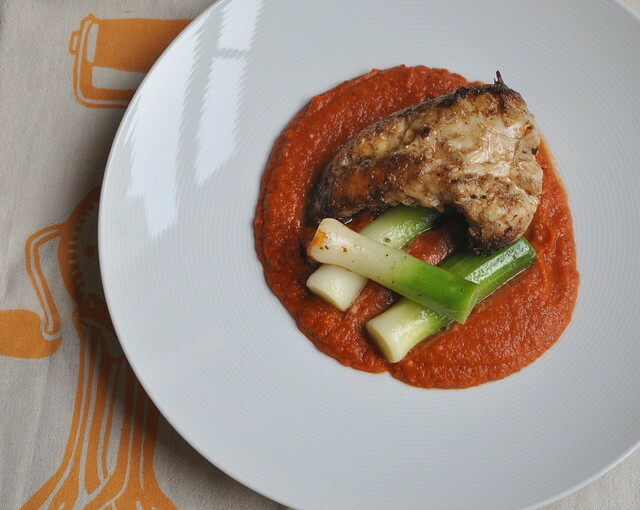 Together with the romesco sauce and the melted baby leeks (you could substitute regular leeks, but slice them into disks as opposed to using small baby stalks), the flavors and texture of the fish contribute to the perfect mouthful. I really think you’ll love it. By the way, if you’re interested in the adorable tea towels that I’ve been using as backdrops for some of my food photos lately (featured above) you can order them from a lovely little Etsy shop called The House of Bouton. 1. Let the fish rest at room temperature for about thirty minutes before you start cooking it. 2. Heat the canola oil in a large non-stick frying pan over medium-high (until the oil just begins to smoke). 3. Season the fillets with salt and place rounded side down into the hot pan. Cook for about 3 minutes, until the side down is lightly golden. 4. Add one tablespoon of butter to the pan, allowing it to melt before adding the second tablespoon of butter. Allow the butter to brown slightly and baste the fish with it while allowing it to cook for another few minutes (until that first side gets to be golden brown). 5. Carefully turn the fillets over, and cook for another 4-5 minutes on the other side and continuously baste with the brown butter. 6. Add the smashed garlic and rosemary springs to the pan, continuing to baste (the garlic and rosemary will give off an incredible aroma). 7. Continue cooking the fish for several more minutes (a thermometer inserted into the center of the fish should register 145 degrees F, but we judged that it was done when it felt pretty firm and flaky). 8. Once the fish is done, transfer it to a plate, along with the garlic and rosemary and tent with foil to keep warm. 9. Prepare the baby leeks: bring a large pot of water to a boil. Meanwhile, prepare an ice bath (just pour water into a large bowl and add ice). 10. Trim the leeks, cut away the dark green leaves and rinse under warm water to clean. 11. Briefly blanch the leeks in the boiling water (about 5 minutes). Immediately transfer to the ice bath. 12. Drain the leeks and dry them with paper towels. Remove the outer layer of each leek. 13. Bring the stock to a simmer over medium heat in a saute pan. Whisk in the four tablespoons of butter into the stock and add the leeks. Toss briefly and season with salt and pepper. 14. To serve: spread the romesco sauce on each plate and place the leeks on top. Place the fish over the leeks and sauce. Drizzle with a bit of olive oil and sprinkle with flaky sea salt. You can also garnish with the rosemary and garlic.